There’s ongoing debate about whether or not the Federal Reserve’s quantitative easing and ECB’s bond purchases have affected U.S. equity markets. Despite the Federal Reserve ending QE in 2014, the stock market has rallied remarkably. The biggest caveat is that while the Fed stopped QE, global monetary easing endured and even grew, courtesy of the BoJ and ECB in particular. Monetary easing globally will start to decelerate sharply in 2018 before starting to fall in 2019 if the projections are accurate. At that point we will see if US stocks are adversely affected by this. 2017 has seen a coordinated rally in almost every country’s stock index as well as a severe drop in the VIX index. 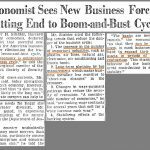 While this type of performance isn’t likely to be repeated, judging by historical precedent, that doesn’t necessarily mean global QE was entirely responsible. While undoubtedly QE has an impact on financial assets, the question is to what extent. The next two years will give us a definitive answer on how QE effects asset prices and to what degree. 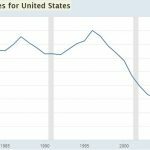 Those that adhere to the Austrian School of Economics hate monetary intervention because it goes against free market principles while adherents of Keynesian Economics downplay the effects of QE. Stock investors love it even if it isn’t the only cause of the rally. This sets up the discussion on the Swiss National Bank. The assessment of how the Swiss National Bank’s asset purchases have affected U.S. stocks is straightforward: it pushes them higher. The SNB is buying stocks which increases demand for stocks. The chart below shows the latest size of the SNB’s holdings as of Q3 2017. Interestingly, the SNB had its holdings increase by $3.5 billion, which is 4.2%, in the last quarter. This is the largest increase from a Q2 to a Q3 in at least the last 3 years. 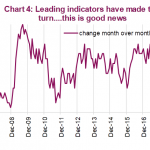 The big increase usually occurs from Q4 to Q1 while the middle quarters are static. It’s tough to rationalize these purchases because the SNB is trying to regulate its currency and inflation through policy, not necessarily make a profit. It’s a weird policy approach to be buying U.S. stocks. It doesn’t appear to be letting up even though the Fed is reversing QE and the ECB is tapering its bond buying program down to 30 billion euros per month in 2018 for the first 9 months and then ending it soon afterwards. The chart below shows the top individual names the SNB owns. The SNB doesn’t own any bank stocks which is somewhat ironic because it is a central bank. It wouldn’t be wise to blindly buy these names or not short them based solely on whether or not its part of the SNB’s equity portfolio. The key is to understand who is on the other side of the table in the marketplace before investing. 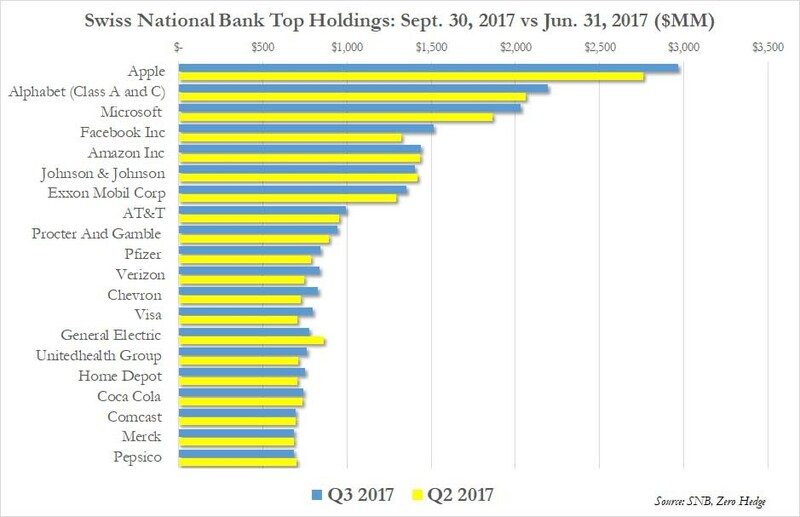 The SNB owns 19.2 million shares of Apple which is more than Schwab and Franklin Resources. In theory, there’s nothing stopping the SNB from printing currency and doubling its Apple position which would have a noticeable effect on the stock. The table below shows some of the smaller holdings the SNB has of firms which don’t make a profit. 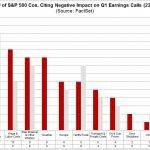 These firms all have negative trailing twelve month profit margins. For some reason, Zynga hasn’t been a big favorite of the firm lately. These firms are smaller, so purchases have a larger effect on the stocks and the underlying markets. Want To Buy Swiss National Bank? One of the weirdest parts of the SNB is that it actually has a stock itself. It is one of a few central banks which is held by private investors with other examples being the Japanese and Belgian central banks. 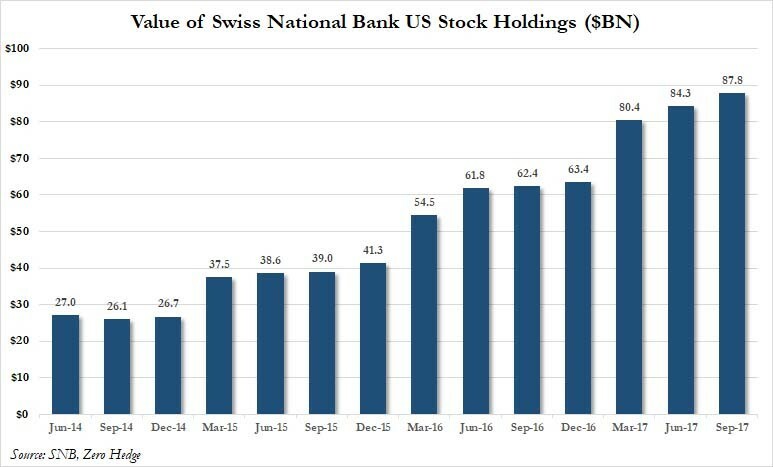 The two reasons why the SNB stock is being ‘discovered’ by the media is because of the SNB’s U.S. stock purchases and due to its recent performance. 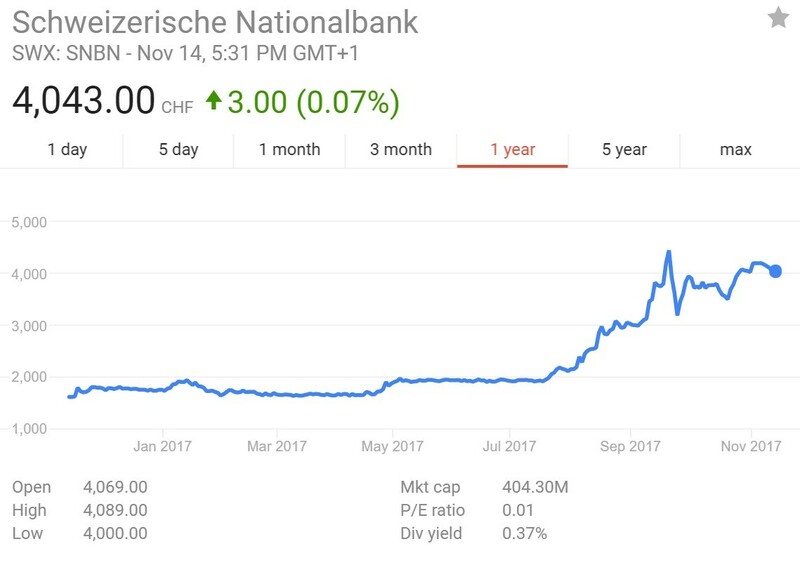 The stock of the Swiss National Bank has more than doubled in 2017 as it’s at over 4,000 Swiss francs. Just like how there’s no rhyme or reason why the Swiss Central Bank buys U.S. stocks, there’s not a clear understanding why the stock has doubled this year. The best explanation is that it is thinly traded. This leads to volatile movements which occur without a catalyst. There isn’t much information on the SNB to analyze besides the monthly balance sheet data and quarterly profits. One economist claimed the stock is up because of the 15 franc dividend which is fixed by law. While interest rates are low, that less than a half of one percent dividend doesn’t seem like a good reason to get involved. As we mentioned, the best explanation is that it isn’t widely traded. There are 100,000 shares outstanding and 174 are traded per day. The SNB doesn’t care about shareholder value; it’s concerned about the Swiss economy. The Swiss franc has declined this year, so the holdings the SNB has in foreign currencies are increasing in value. However, the shareholders don’t get exclusive access to the gains. The federal government and cantons get 2 billion francs per year, while the private shareholders are left with 1.5 million francs. The SNB directly has an outsized impact on US equity markets which in the long-term creates distortions that eventually return to reality, crushing investors along the way. Understanding whether central banks have your back as an investors is a dilemma that creates moral hazard, something which will be tested in 2018 and 2019 as global monetary stimulus is projected to subside. NextIs The Consumer Healthy Or Indebted?